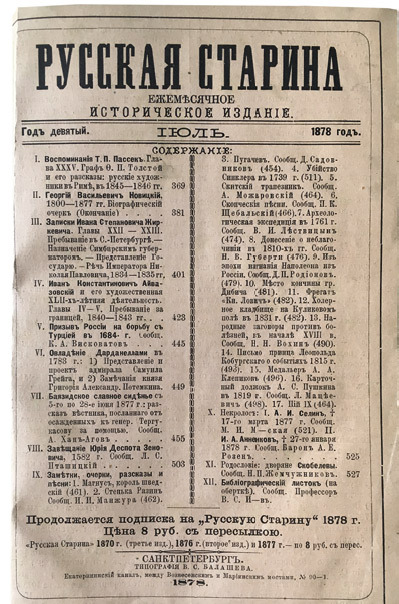 The beginning of the 19th century saw remarkable growth in the periodical publishing industry in Russia. 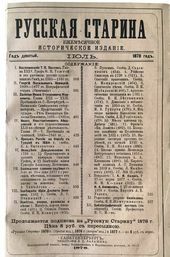 In the first decade of the century that would come to be seen as the “Golden Age” of Russian culture, there were more than 80 magazines and newspapers in circulation, covering a wide variety of topical and socially significant subjects. The history and theory of Russian and world art received ample coverage: these subjects were always of interest to keen readers, and were seen by editors as priority areas. Leafing through periodicals of that time some two centuries later, we still sense the echo of the past, allowing us to form an impression of the atmosphere of the period; reading on, we plunge into the thick of its eventful artistic life. The rich, yellowed pages yield countless fascinating details and new facts concerning the work of many Russian masters, even those whose oeuvre, at first glance, appears well-studied. Ivan Aivazovsky's name was seldom absent from such magazine and newspaper articles. Throughout his entire career, his life and work was always keenly scrutinized by journalists and commentators - some were the artist's devoted followers, others his hostile foes. Whilst some articles lauded the painter's talent, others sought deeper meaning in his works, claiming to uncover parallels with literature. Still more would chide the marine painter for his “excessive” imagination, expressing doubt about the accuracy and objectivity of what he depicted. The press regularly followed the events of Aivazovsky's life, announcing the dates of exhibitions or discussing their success, publishing private letters and reviews. Most magazine and newspaper articles, however, contained poetically phrased musings on Aivazovsky's style and method, all of which, it should be noted, helped in the end to bring his works unprecedented success. The authors would discuss Aivazovsky's unique painterly techniques after having viewed his works or spoken to him in person. This makes such writings especially valuable: they can be seen as logging Aivazovsky's creative development, his thoughts and plans. As 21st century researchers looking through these periodicals, we can now compare the painter's projects and ideas with his actual output. 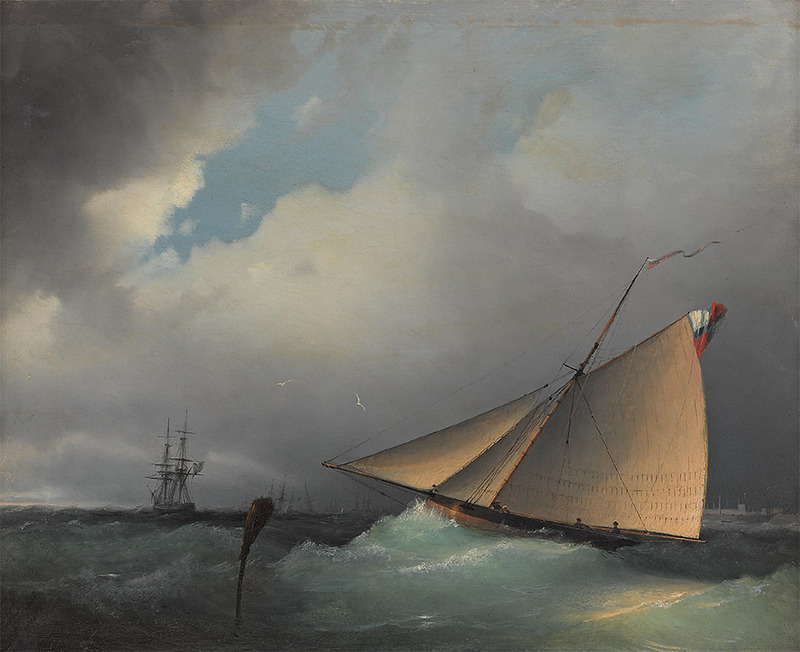 Besides that, the articles enable us to see how Aivazovsky's work was regarded by his contemporaries at a time when the artist was in the early stages of his creative development. “Italy lies ahead,” Kukolnik continued. “The charming prospect lights up the artist's imagination from afar, as if teasing him with this enchantress's as yet unrealized hopes for his rapidly unfolding talent. Italy! This word contains the artist's second nature, the second half of the gifts hidden in the treasure trove of his soul; it is up to her to summon them forth. Yet just as not every one of us knows how to make use of the gifts offered to us by beneficent nature, so not every artist knows how to make use of the lessons and the skies offered by Italy.” Aivazovsky, it seems, took good heed of these words. In Italy, his aesthetic sense and views on art became fully formed, and he was able to develop his own unique painterly method and vision of nature. On July 3 1840, the Conference Secretary of the Imperial Academy of Arts Vasily Grigorovich signed a certificate for a grant to be allocated to a group of graduates of the Academy in order that they might travel abroad and perfect their skills. Those who were set to go to Europe included the genre painter Vasily Sternberg, the architect Grigory Elson and several landscape artists, the best known of whom were Sokrat Vorobyov, Login Frikke, Ivan Aivazovsky and Mikhail Elson. 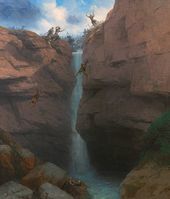 “Only recently, we had a real shortage of good landscape artists. Now in one year, Italy is receiving seven Russian landscape painters, each of whom is already making a name for himself in Russia,” wrote a columnist in “Khudozhestvennaya Gazeta”. During his travels, the young artist was careful to remember the advice of Bryullov, and indeed, it so happened that the works of Sylvester Shchedrin, with whom “the Great Karl” had compared him, became his standard to be emulated - or, perhaps, the foundation from which his rapid creative growth would spring. To say that Aivazovsky saw the magnificence of Italy through the eyes of his famous predecessor would be no exaggeration. Based in the resort town of Sorrento, he began to paint landscapes from the “vantage points” discovered by Shchedrin. 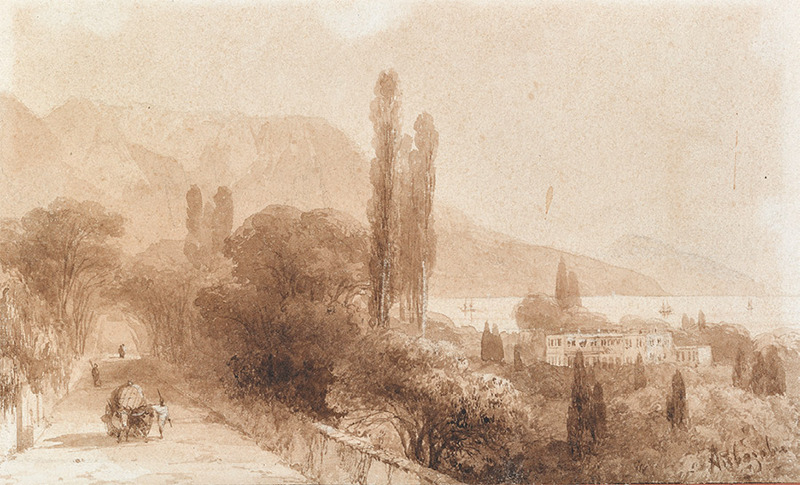 “Whilst living in Sorrento, I undertook to produce a view of the town from the same location that Shchedrin had used, years before. Beginning with the sky and ending with the foreground, I proceeded to reproduce everything that lay before me with photographic precision. I painted for exactly three weeks. After that, I created a view of Amalfi in exactly the same manner,” Aivazovsky was quoted in “Russkaya Starina” (Old Times in Russia) magazine. Before long, however, the young artist realized that in their perception and interpretation of nature, he and Shchedrin were entirely different. Where the older master had favoured contemplative, lyrical seascapes, Aivazovsky preferred to portray dynamic scenes. Turning to dramatic subjects, he would choose unusual, vivid tones, which very quickly drew the attention of an enraptured public. The Russian romantic painter's highly emotional, vivid works caused quite a stir in European art circles, too. 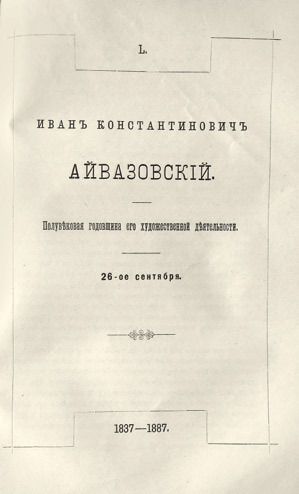 Articles began to appear, detailing Aivazovsky's successes and the rapid growth of his popularity abroad. “Naturally, we were always delighted by the wonderful talent of our young compatriot, but success in Italy for an artist is a truly great thing, and now we are truly thrilled to add a new, glorious name to our annals, to the joy of all lovers of fine art. And to the glory of the arts in Russia,” “Khudozhestvennaya Gazeta” enthused in 1841. In his exploration of the region around Naples, Aivazovsky was constantly observing the shifting beauty of water, attempting to comprehend all the mysteries of its mesmerizing, magical transformations. His visual impressions were then adeptly expressed as artistic images filled with beauty and special meaning. “I have already been in Naples for two months, and I have been constantly busy... I am shortly to visit Amalfi for five days, to observe the sea's current fury and the noble cliffs. 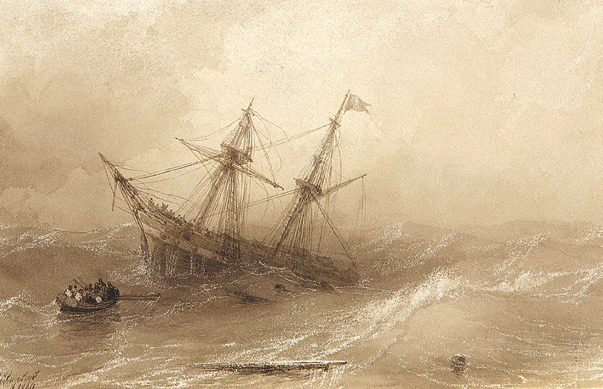 After this, I plan to paint a tempest,” Aivazovsky wrote in a letter to Grigorovich. Even at this early stage, it was clear that Aivazovsky could not picture his art without poetic imagination and fantasy, which inspired him more than did the mere reproduction of reality. In Italy, the painter became more firmly convinced than ever that in blindly copying nature, he produced works that were less effective, less striking, less aesthetically pleasing. Aivazovsky valued the beauty of improvisation, the lightness of painterly touch, while prosaic, everyday reality constrained him, limiting his passionate creative temperament. Possessing the gift of integrating vision, the artist quickly learned to portray the inconstant sea in all its sudden moods and manifestations. 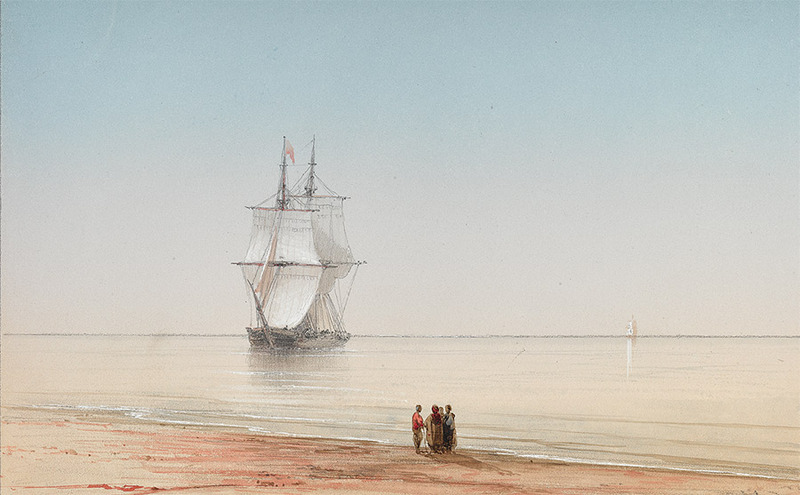 Following these important observations from his stay in the Kingdom of Naples, the artist was able to formulate the main principles of his artistic method and even to develop his own theory: ‘A painter who merely copies nature, becomes its slave, he is bound, hands and feet.” “The tempest I observed on the Italian coast can, in my painting, be transported to some location in Crimea or in the Caucasus; a ray of moonlight reflected in the Bosphorus, I use to illuminate the fortifications of Sevastopol. Such is the tendency of my brush, the peculiarity of my artistic temperament,” Aivazovsky explained. 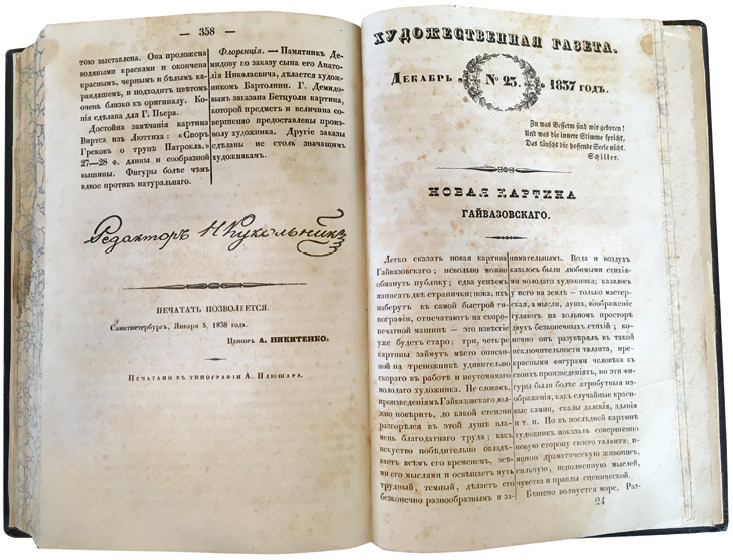 These musings of the artist were recorded in shorthand and, in 1878, reproduced, just as Aivazovsky had expressed them, in the monthly historical magazine “Russkaya Starina”. A keen observer, Aivazovsky cannot be accused of distorting nature. 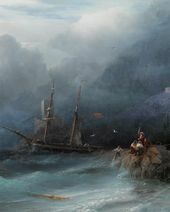 “Aivazovsky has a passionate feeling for the sea, experiencing it with his entire being,” “Otechestvenniye Zapiski” (Annals of the Fatherland) magazine observed. In his landscapes, the artist accurately notes and obediently observes all the laws of nature and all its phenomena. In his desire to capture nature, “Academy student Aivazovsky... was at sea during His Imperial Highness the General Admiral's voyage, and certainly made full use of this opportunity to study nature and to achieve still greater success in the painting of seascapes.” Furthermore, “a landscape should primarily possess climatic accuracy... so many difficulties await the young artist attempting to carry out his duties honourably!” “Khudozhestvennaya Gazeta” wrote. 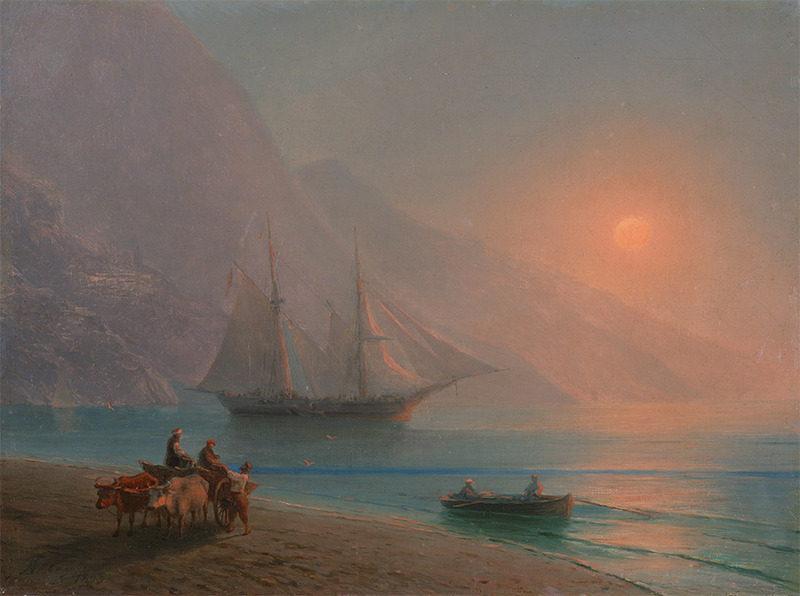 Other artists were, it seems, of a similar opinion concerning Aivazovsky's work. 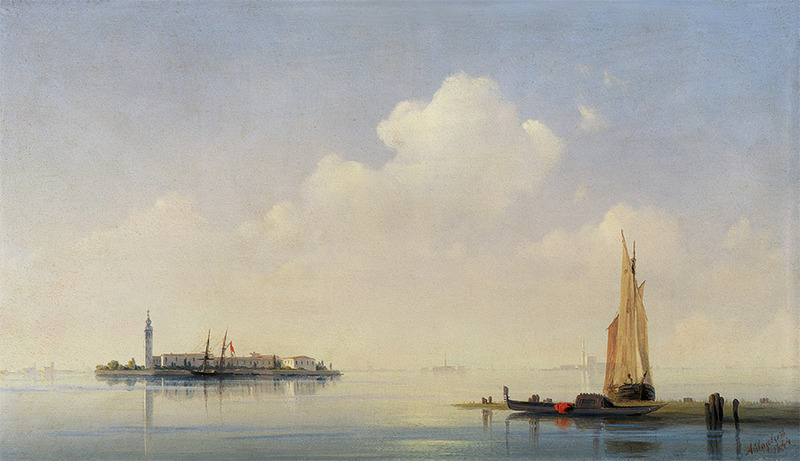 In his speech at the opening of an exhibition featuring works by Aivazovsky at the Moscow School of Painting and Sculpture, the sculptor Nikolai Ramazanov said: “None of our artists portrays as accurately as does Aivazovsky the life of the sea, no one succeeds, like him, in depicting that transparency of the air, and no one remains as true to the air's perspective as he does. A true talent that is full of life is always evident, even in the smallest things that it undertakes occasionally whilst resting in between more serious tasks.” Ramazanov's speech was published in “Moskvityanin” (The Muscovite) in 1854. 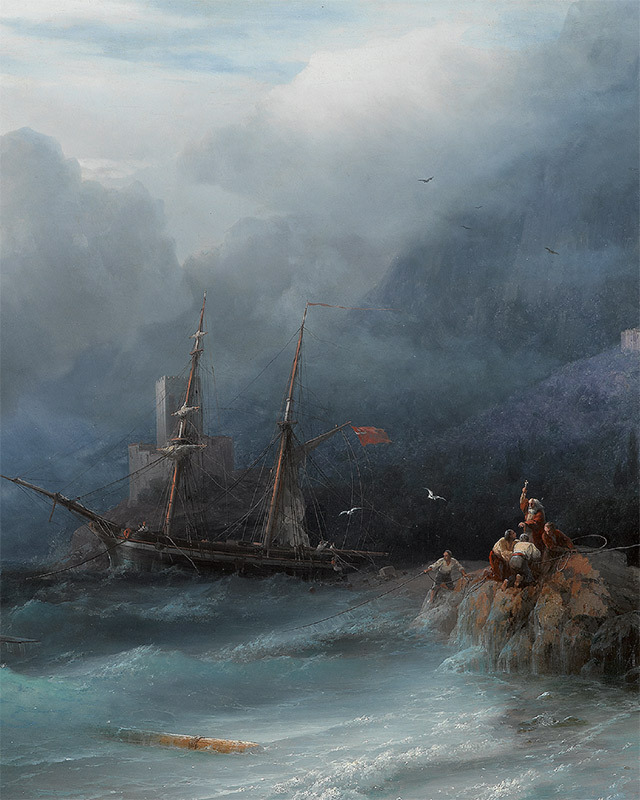 In their attempts to explain the astonishing nature of Aivazovsky's gift, the more adventurous journalists would occasionally ascribe to the landscape artist qualities or even ailments that were totally unfamiliar to him. Spiridon Caccioni, who was fortunate to enjoy a lengthy debate with Aivazovsky in the artist's Feodosia studio, wrote a fascinating and detailed “Biographical Essay” on him, published in “Nov” magazine in the winter of 1885. 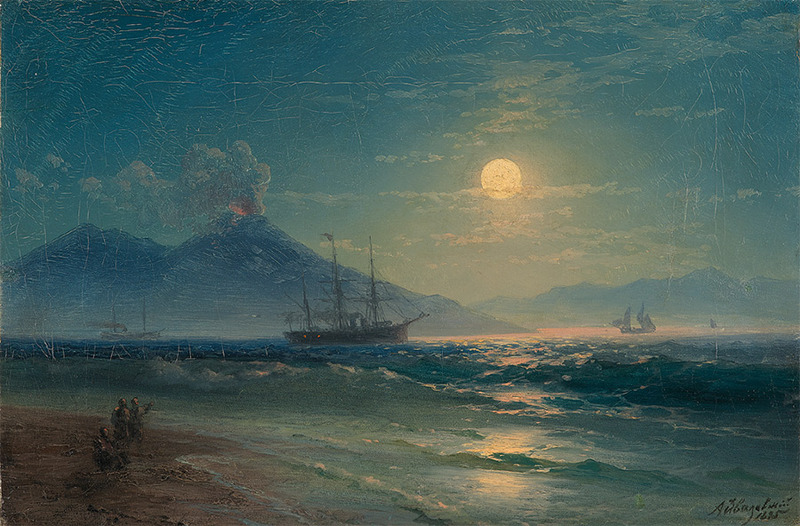 One German paper, Caccioni lamented in his essay, had “shamelessly” claimed that Aivazovsky was deaf from birth, using such an explanation to account for the artist's “incredibly sensitive vision”. Aivazovsky himself never denied that he worked mostly from memory, actively using his imagination, as if an invisible genius of inspiration was moving his hand. “Besides my hand and my imagination, my paintings are always created with the aid of my artistic memory also, which God granted me in abundance... I often recall with startling clarity things I saw decades ago,” the artist would say to his admirers. 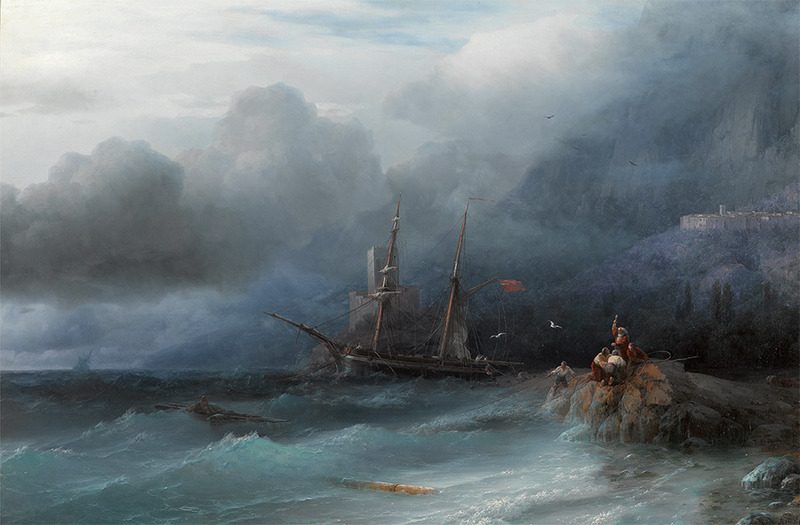 Aivazovsky's art was perhaps not so much about portraying marine views as they were, but about creating myths, telling magical tales about the sea. The artist's whimsical love of fantasy, his generalized imagery and “literariness” were perceptively noted by Fyodor Dostoyevsky. 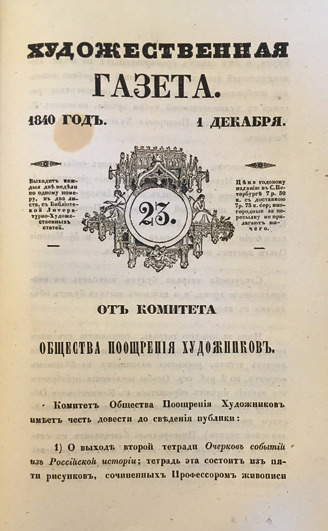 In 1861, the journal “Vremya” (Time), which was run by Dostoyevsky with his brother Mikhail, published the writer's article on the “Academy of Arts Exhibition of 1860-61”. In this anonymously penned piece, Dostoyevsky takes on the role of art critic to compare Aivazovsky's work with the labour of a writer. “Khudozhestvennaya Gazeta” also paid tribute to the artist's superior awareness and accuracy in portraying the rigging of ships. 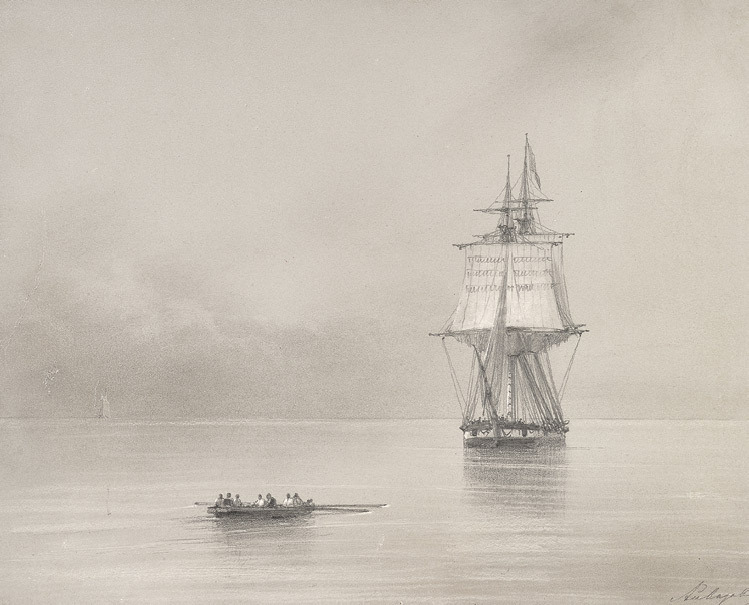 “Naval officers interested in art have commented that... not only are all the ships' details in his paintings in accordance with the strict rules of shipbuilding, but all the parts of the ships are also full of beauty and harmony, thereby fulfilling the main condition and captivating us with their elegance and architectural charm.” Indeed, in 1836, Aivazovsky had been seconded to serve as resident artist on board the ships of the Baltic Fleet: his knowledge of shipbuilding was beyond question. We have examined only some of the most vivid accounts of the great Russian landscape artist's life and work, yet even these few testimonies are sufficient to offer a fascinating insight into Aivazovsky's unique talent and unrivalled artistic gift. Perhaps the main result of this analysis, however, has been to take a marvellous journey into the past, one that has enabled us, in company with the artist, to experience some of the key events in his rich creative life. A life, at the beating, tirelessly pulsating heart of which was ever the Sea - tender, fierce, calm, terrible, but always mysteriously alluring and whimsical. ‘The Annual Exhibition of Works of Art at the Imperial Academy of Arts’. Article II // “Khudozhestvennaya Gazeta” (The Arts Gazette). 1837, issue 20, October 19. P. 318. Hereinafter - Article II. ‘Aivazovsky’s New Painting’ // “Khudozhestvennaya Gazeta”. 1837, issue 23. P. 359. 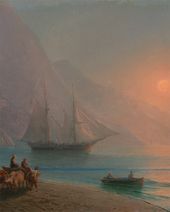 Aivazovsky’s Crimean Paintings’ // “Khudozhestvennaya Gazeta”. 1840, issue 23, November 15. P. 28. Timm, VF. ‘I.K. Aivazovsky’ // “Russky Khudozhestvenny Listok” (The Russian Arts Sheet). 1858, issue 10, April 1. P. 1. 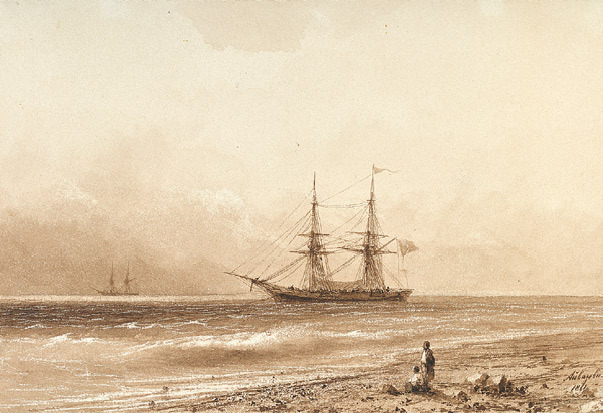 Caccioni, S.A. ‘Ivan Konstantinovich Aivazovsky. A Biographical Essay’ // “Nov” (The New). 1885, issue 1. P. 122. Hereinafter - Caccioni. Aivazovsky’ // “Khudozhestvennaya Gazeta”. 1840, issue 15, August 1. P. 1. 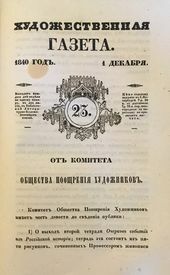 ‘Report of the Imperial Academy of Arts for the Academic Year of 1839-1840’ // “Khudozhestvennaya Gazeta”. 1840, issue 3, February 1. P. 6. 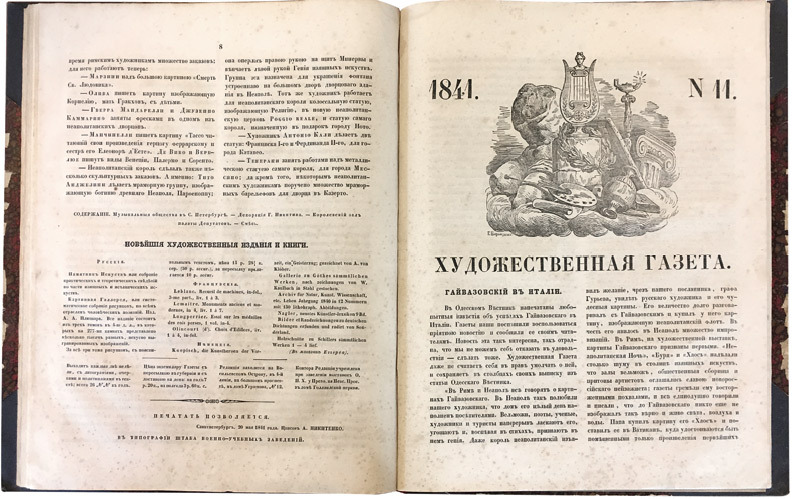 ‘Report of the Imperial Academy of Arts for the Academic Year of 1839-1840’ // “Khudozhestvennaya Gazeta”. 1840, issue 24, December 15. P. 6. Letter from Ivan Aivazovsky to Vasily Grigorovich. 30 April 1841 // Department of Manuscripts, National Library of Russia. Collection 9, file 3, folio 5. Karatygin, P.P. 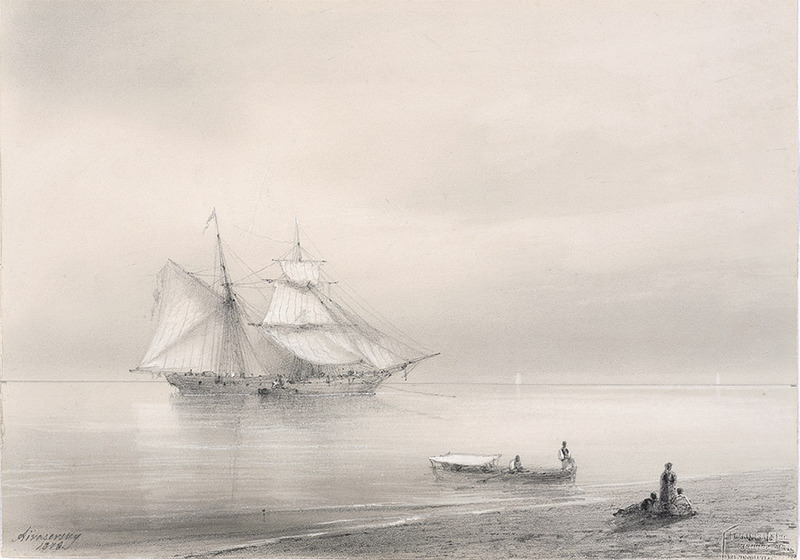 ‘Ivan Konstantinovich Aivazovsky and His Forty Two Years of Artistic Activity. 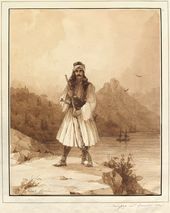 1836-1878. The First Year Abroad. 1840-1841’ // “Russkaya Starina” (Old Times in Russia), 1878, July. P. 425. Hereinafter - Karatygin. 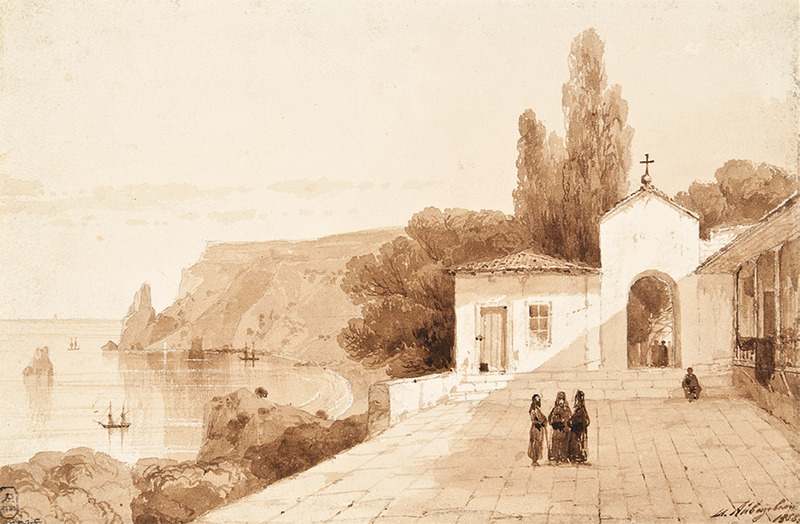 ‘Aivazovsky in Italy’ // “Khudozhestvennaya Gazeta”. 1841, issue 11. P. 3. Hereinafter - Italy. Letter from Ivan Aivazovsky to Vasily Grigorovich. 2/20 December 1840 // Department of Manuscripts, National Library of Russia. Collection 9, file 3, folio 3. The Exhibition at the Academy of Arts’ // “Otechestvenniye Zapiski” (Annals of the Fatherland). 1842, vol. 25. P. 25. The author is referring to the nine-year-old Grand Duke Konstantin Nikolayevich. ‘Report of the Imperial Academy of Arts for the Academic Year 1836-1837, Read Out at the General Meeting of the Academy by Conference Secretary Vasily Grigorovich on 26 September 1837’ // “Khudozhestvennaya Gazeta”. 1837, nos. 17-18, September. P. 276. 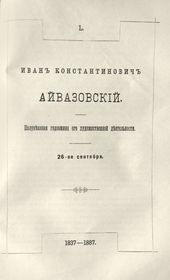 ‘Letter to Aivazovsky’ // “Khudozhestvennaya Gazeta”. 1837, issue 14, July. P. 223. Timm, VF. “I.K. 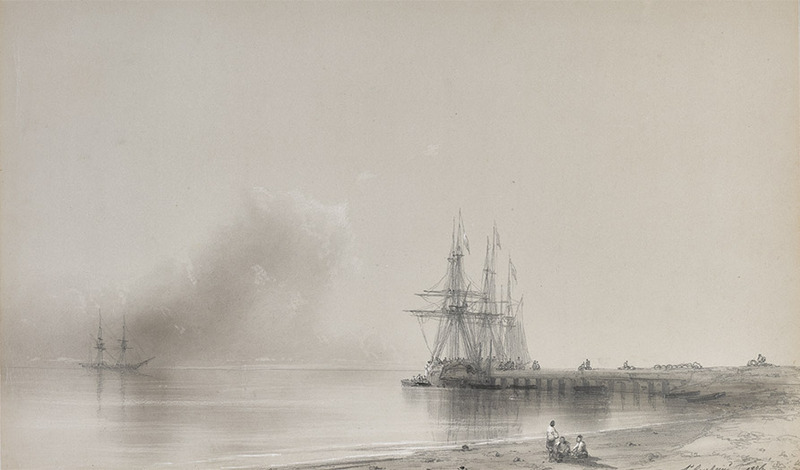 Aivazovsky” // “Russky Khudozhestvenny Listok” 1858, No. 10, April 1. P. 2. Ramazanov, N.A. // “Moskvityanin” (The Muscovite). 1854, issue 24. 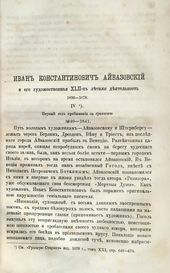 ‘Letter to Aivazovsky’ // “Khudozhestvennaya Gazeta”. 1837, issue 14, July. P. 222. Aivazovsky’s New Painting’ // “Khudozhestvennaya Gazeta”. 1837, issue 23. P. 359. ‘Unsigned. The Academy of Arts Exhibition of 1860-61’ // “Vremya” (Time). 1861, issue 10, section II. Pp. 147-168. Ibid. Dostoyevsky, F.M. ‘The Academy of Arts Exhibition of 1860-61’ // “Complete Works and Correspondence in 30 Vols.” Vol. 19, Articles and Essays 1861. Leningrad, 1979. P. 161. Aivazovsky’ // “Khudozhestvennaya Gazeta”. 1840, issue 5, August 1. P. 4.